Arrange the hash browns around the edge of a square or oblong shallow oven proof dish and place in the preheated oven (350 degrees) for 10 minutes. Meanwhile beat the eggs and milk together and season well. 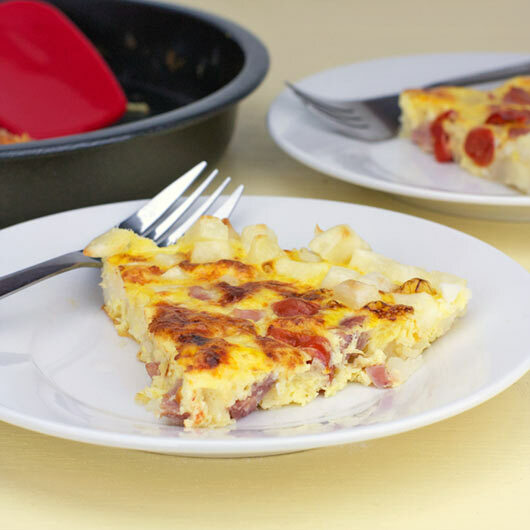 Add the ham, tomato and cheese. After 10 minutes rearrange the hash browns so that they line the edge of the dish, slightly overlapping if necessary. Pour the egg mixture into the center. Return to the oven and cook for 10 -15 minutes or until the has browns are crisp and golden and the egg mixture is set. 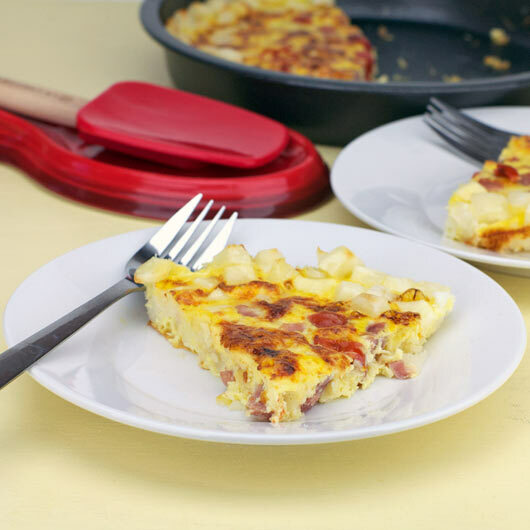 The best of breakfast in one easy-to-make dish: eggs, hash browns, ham and cheese. Recipe number 171. Submitted 5/4/2002.